A gazebo can be just the addition your home needs. If you’re looking for the perfect focal point for your outdoor space, shade for your yard in the summer, or ways to up your outdoor entertainment game, a gazebo can be just the addition your home needs. There are many reasons to add a gazebo to your landscape this year, and the right deck and fencing professionals can help you select, build, and maintain your perfect gazebo. These structures add beauty, focus, and value to your home, and there are a variety of options available to find the perfect gazebo for you. Here are just three reasons to consider a gazebo for your landscape. A gazebo won’t merely add a shady spot to your lawn–it helps you create a beautiful landscape and add value to your home. These structures don’t just add aesthetic value, but a solid, functional feature that can appeal to potential future home buyers. A gazebo is part of your home forever, making it a significant investment that you can enjoy for years. 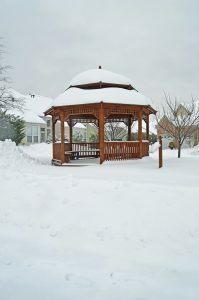 When you build a gazebo for your home, there are some options for material and design that can allow you the freedom to create a unique landscaping feature. Your gazebo can represent your style and be made to complement your home and landscaping perfectly. There are as many options for gazebos as there are for fences and decks. While most think of the classic white gazebo that you find in a flower garden or park, the possibilities for your gazebo design are endless. Choose between traditional styles of wooden gazebos or a contemporary stone structure to create the perfect gazebo for you. The right landscaping can make for excellent entertaining and outdoor enjoyment through the spring, summer, and even the fall. During the hot months, a gazebo can provide shady relief, giving you the opportunity to enjoy your outdoor space while staying cool. With a beautiful addition to your landscaping, you can stay cool, take advantage of summer breezes, and relax while enjoying your landscaping. A gazebo can improve your barbecues or quiet afternoons by providing a lovely, serene place to simply sit and enjoy your outdoor space.